This gift box has a length of about 5.5 in, a width of about 5 in, a height of about 2.5 in and a Net WT of 12 oz. These are the luscious chocolate covered almonds people dream about—big, plump, incredibly flavorful California almonds, roasted to mellow perfection in our on-site roasters and covered in our own sinfully rich, insanely delicious milk chocolate. Unlike the small, over-processed and overpriced chocolate almonds found in stores, these deliver an authentic melt-in-your-mouth crunch that signifies the absolute peak of freshness and flavor. Their velvety aftertaste is perhaps one of the most pleasing sensations imaginable. 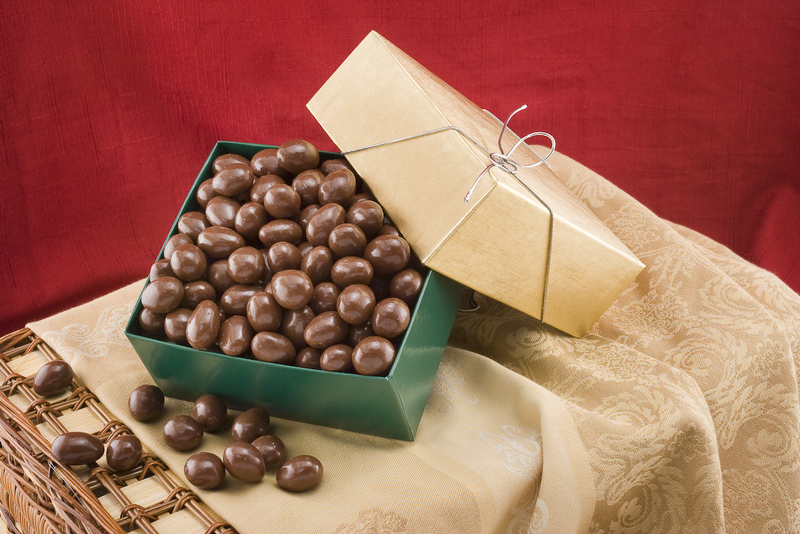 Try them once, and you will always remember what it’s like to enjoy the finest chocolate almonds in the world. Net wt. 12 oz. Allergy Information: Contains Almonds. This product is produced at a facility producing peanuts and other nut products. may contain elements of peanuts or tree nuts. This was a gift to a client. He said the nuts were excellent. These were bought for my auntâ€™s birthday. They arrived on time, and she loved them. I gave these Chocolate Covered Almonds to friends. They said they are very good and delicious.